Over at Prawfsblog, Kurt Lash has a post on Incorporation of the Establishment Clause. Kurt did pioneering work on this issue back in the day, work which is rightly esteemed. In the first part of his post, Kurt argues that people at the time of the 14th Amendment understood the meaning of the Establishment Clause differently than they did at the time of the Bill of Rights. And he argues that the 14th Amendment should get the meaning in existence at that time. The Supreme Court has rejected the two-track approach, and rightly so, I think. The Fourteenth Amendment declares that the states are bound to enforce “the privileges or immunities of citizens of the United States.” One of these privileges was the privilege of non-establishment declared by the federal Establishment Clause. To the people who adopted the Fourteenth Amendment, there were not two principles of non-establishment, only one; the principle already existed in regard to the federal government and it was now to be applied against the states. It is almost as if, in adopting the Privileges or Immunities Clause, the people readopted the original Establishment Clause and declared its principles—as they understood those principles- now operative against both state and federal governments. If correct, then this means that Marsh v. Chambers got it exactly backwards. We should not look to the original Founding to determine the content of Reconstruction liberty; we should look to the meaning of Reconstruction liberty to determine the content of the readopted Bill of Rights. I beg to differ. If Kurt believes that there can only be a one track approach, then the much stronger argument is that the 14th Amendment incorporated the 1791 meaning of the Bill. Under this view, 14th Amendment might be referring to "the original Bill as enacted in 1791," which is certainly a plausible view. Kurt writes: "It is almost as if, in adopting the Privileges or Immunities Clause, the people readopted the original Establishment Clause and declared its principles—as they understood those principles- now operative against both state and federal governments." Exactly -- it is almost as if. But the 14th Amendment simply did not do that, and there is no obvious way that it can be understood to have amended the original Bill. I don't know why people are so quick to resist a two track approach. It makes sense that the same provisions adopted at different times might have different meanings. And it might make sense to impose different restrictions on different levels of government. In the critically important area of preemption, the Supreme Court’s approach to statutory interpretation differs from the approach it follows elsewhere. Whether in politically salient matters, like challenges to Arizona’s immigration laws, or in more conventional cases, such as those in which state tort liability overlaps with federal regulation, the Court’s preemption decisions reflect a highly purposive approach to reading statutes, most notably through the application of “obstacle preemption” analysis. Recently, however, Justice Thomas has objected to the Court’s failure in preemption cases to respect its more textualist approach to issues of statutory interpretation, and he has urged that obstacle preemption be abandoned. Although three other justices have endorsed some aspects of Justice Thomas’s approach, no dramatic shift in the Court’s approach has yet occurred. This Article examines recent preemption decisions and seeks to explain why textualist premises have so little grip in this domain. One might therefore view this Article as, in part, a case study of the feasibility of textualism. I argue that Congress lacks the capacity, foresight, and linguistic tools to be able adequately to specify in statutory text the proper resolution of the range of preemption issues that invariably arise under regulatory statutes of any complexity. Consequently, the task of fashioning a workable legal system that integrates state and federal law necessarily falls to courts (with assistance in some instances from federal administrative agencies). This Article concludes by examining recent challenges to the presumption against preemption that Professor Nelson posed and Justice Thomas endorsed. It criticizes the Nelson/Thomas understanding that the Supremacy Clause calls for rejection of the presumption against preemption and explains the significant role that that presumption continues to play. My strong instinct is not to be persuaded. I would think that Congress at least possesses the linguistic tools to address preemption issues as they arise (no less than the courts do, in any event). Congress may lack the capacity to act in the sense of not being willing to devote the time to resolving preemption issues as they arise, but that is Congress' choice (and my guess is that Congress would find time to take an active role if the courts were not taking over the role). And at bottom the lack of institutional capacity by Congress (even if true) is not a reason for the courts to expand their role; it is, rather, part of the design of separation of powers and federalism. But Professor Meltzer is not someone to disagree with lightly. Modern legal scholarship has been highly critical of the Supreme Court’s precedent governing when a state may apply its law to conduct that occurs beyond its borders. Under this precedent, while a state court has broad discretion to apply forum law through its choice of law analysis, a state legislature may not pass legislation which regulates wholly extraterritorial conduct. Courts and scholars have long argued that the prohibition on extraterritorial legislation should be abandoned and that, under principles of federalism, stricter constitutional limitations should be placed on a state’s choice of law. Moreover, scholars have argued that these doctrines are inconsistent because there is no meaningful distinction between action by a state’s courts and its legislature. This Article responds to such criticism by arguing that the Court’s doctrines are fully consistent with the treatment of extraterritorial state power under the antebellum Constitution. 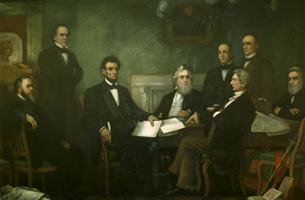 In the decades leading up to the Civil War, the most important legal, political, and social issue of the day — the subject of slavery — provoked one of the country’s first and most contentious disputes over the extraterritorial application of state law. When arguing for the rejection of southern law, northerners asserted that any forced application of the law of slavery would infringe on fundamental aspects of the sovereignty of the northern states. In response, southerners contended that, under implicit principles of federalism which commanded that southern law to be treated on equal terms, northern states were constitutionally required to apply southern law when ordinary choice of law rules so dictated. Facing this conflict between principles of state sovereignty and state equality, northern courts followed traditional legal doctrine by holding that state sovereignty must prevail. An appreciation of the importance of state sovereignty to the antebellum constitution helps to make sense of the Court’s modern extraterritoriality doctrines. If state sovereignty is viewed as a fundamental tenant of federalism, any limitations on a state’s ability to apply its own law should come only from the Due Process concerns of individual litigants. A robust view of state sovereignty also fully supports the Court’s prohibition on extraterritorial legislation, despite recent judicial criticism of the doctrine. Finally, because forcing a state court to apply and enforce the law of another sovereign has very different implications for state sovereignty than a rule prohibiting a state legislature from regulating conduct in another state, state sovereignty provides a potential way to reconcile the modern Court’s differing treatment of state courts and state legislatures. The termination of U.S. treaties provides an especially rich example of how governmental practices can inform and even define the Constitution’s separation of powers. The authority to terminate treaties is not addressed specifically in the constitutional text and instead has been worked out over time through political branch practice. This practice, moreover, has developed largely without judicial review. Despite these features, Congress and the President — and the lawyers who advise them — have generally treated this issue as a matter of constitutional law, not merely political happenstance. Importantly, the example of treaty termination illustrates not only how historical practice can inform constitutional understandings, but also how these understandings can change. In the nineteenth century, the prevailing view was that the termination of treaties required either congressional or senatorial approval. That understanding changed in the twentieth century, and unilateral presidential termination became the norm. The contours of this shift likely apply to other issues of constitutional law relating to presidential authority: First there is a consensus, both among the governmental actors and in the scholarly community. Then deviations take place with a potentially limited scope. The Executive Branch proceeds to articulate broader theories of the deviations. Congress’s resistance is intermittent, depending on whether it objects to the deviations on policy grounds. Practice then builds up around low-stakes examples. Eventually a more controversial example arises and the President pushes forward successfully, thereby consolidating the changed understanding. This dynamic of accretion and consolidation of institutional practice is not adequately captured by theories of constitutional change that focus on judicial review or that emphasize particular moments of contestation or public deliberation. The government's response in Bond v. United States, the upcoming test of Congress' treaty implementation power, is available here (via Nick Rosenkranz). (Thanks to the American Bar Association's website Preview of United States Supreme Court Cases, an invaluable resource). There is also another important amcius for respondent filed by Jenny Martinez (Stanford) on behalf of professors of international law and legal history. For some reason I have not been able to find it online. I saw an earlier draft; it principally argues on textual and historical grounds that the treatymaking power is not limited by Congress' enumerated powers. (I agree; see here). RELATED: At SCOTUSblog, Academic Highlight: Questioning Congress' Authority to Implement Treaties (discussing the Nick Rosenkranz article that provides the academic force behind Bond). In his article, Rosenkranz contends that Missouri v. Holland is at odds with the fundamental constitutional principle that the federal government can only act within its enumerated powers. He musters textual, structural, and historical arguments for his view, and contests Professor Louis Henkin’s reading of the Constitution’s drafting history, which both Henkin and the Supreme Court have cited in support of Holland’s rationale. As Rosenkranz observes, the question of Congress’s power to implement treaties has taken on added importance now that the Supreme Court is more actively policing the boundaries of Congress’s power. Bond’s lawyers also make this point in their opening brief in the Supreme Court, in which they argue that if Holland is not overruled or limited, Congress could use treaties to perform an end run around carefully crafted federalism limits on its authority to legislate. Justice Scalia and Bryan Garner spoke in San Diego yesterday to the Association of Business Trial Lawyers (thanks to William Caldarelli for inviting me to attend). The talk was an engaging tour through the highlights of their book Reading Law, which is of course, among other things, a defense of (indeed, a celebration of) textualism in legal interpretation. Among many interesting comments, Scalia said that the two main rivals to textualism are "purposivism" and "consequentialism" -- the former being an attempt to go beyond the text to discern what the drafters wanted, or would have wanted that they thought about the issue at hand; and the latter being an attempt to decide what the best current policy would be. So-called "living constitutionalism", he added, is really just an example of consequentialism applied to constitutional interpretation. Scalia explained his core objections to the two rivals [my summary and oversimplification] as (a) consequentialism violates democracy and separation of powers by having judges rather than elected legislatures make law, and (b) purposivism (i) is subjective and speculative, and in any event (ii) misunderstands the nature of law, in that only the text itself, not the intentions or desires of the drafters, is binding. (1) One of the most striking aspects of the book, reinforced by the talk, is that Scalia's theory is not about the U.S. Constitution, or even about constitutions generally, but about the nature of law in a democratic society. His constitutional originalism is an incidental corollary of a broader and more fundamental way of thinking about law. (2) After I gave a quick summary of the talk to a smart colleague who is not deeply immersed in these debates, her immediate response was: "Doesn't he have a problem with common law"? That seems a fair question, because if the answer is "yes," he would be going against a lot of Anglo-American tradition, and if the answer is "no" then his critique of judicial consequentialism (in statutory matters anyway) might need some further elaboration. (4) I wonder if there are other important categories beyond purposivism and consequentialism. I think there is at least one other: tradition or custom. Take the recess appointments case, for example. Even if President Obama's "recess" appointments are clearly contrary to the Constitution's text, one might say that a longstanding practice of similar appointments by the President, without objection from Congress, should point to upholding the appointments. That conclusion does not depend on the drafters' purpose or upon any consequentialist views of the best appointments policy. (But see this critique of arguments from custom). In a federal system of government where separate levels of government share power, who, the national or state governments, controls immigration policy? In the 19th century before the Civil War, states almost exclusively ran immigration with the federal government relegated to naturalization and shipping policy. The text of the U.S. Constitution only accounted for a small part of that particular division of labor. Equally if not more determinative were the strong political cultural influence of the concept of salus populi or concern for the public interest over individual and commercial rights, and the Civil War that restructured the relationship between the national government and the states. In this time period, the allocation of power between the national and state governments was mostly determined by factors outside the U.S. Constitution and as this constellation of non-constitutional factors changed, so too did the power sharing agreements between levels of government. Part One of this post was originally written several days ago, but I forgot to cross post it here. I then wrote Part Two yesterday. One of the continuing disputes that originalists have is with historians. Very few historians are originlists, and many have no respect for the enterprise at all. It is telling that Gordon Wood, some years ago, defended originalists by saying something to the effect, their theory is mistaken, but many of them are nice people. With friends like that . . . . Historians often criticize legal scholars, including originalists, for doing “law office history,” by which they mean the legal scholars cherry pick historial information simply to support their case. This is sometimes true, even of originalists, but all originalists recognize that this is bad practice and criticize one another for doing so. Law office originalism is bad originalism, but that does not mean there is not good originalism. 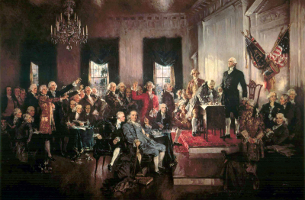 Originalists, however, also criticize historians – for what originalists call “history office law.” History office law can involve a failure to understand and be careful about legal issues. But perhaps it most often involves a mistaken understanding of the enterprise of interpretation as practiced by originalists. There are various originalist methodologies and the differences are important. But to take just one originalist methodology, the original public meaning approach asks what the meaning of a provision would have been to a reasonable and knowledgeable person at the time. Historians often do not understand or apply this correctly. And they often make statements that originalists would strongly disagree with, without any strong reasons backing them up – statements such as, because there was disagreement at the time of the Constitution on a provision, that means there was no original meaning. My sense is that these differences are due to a variety of causes. One is that the historians often lack legal training. Another is that they appear to be trained to be skeptical of reaching conclusions that suggest a single (or dominant) view at a time (in part based on the notion that that would be an oversimplification of the complexity of history). And a third is that people are not necessarily good at everything and if one has the skills to be a historian, he or she may not have other skills. I was reminded of all this when I saw that Pauline Maier had passed away, just a few years after publishing her very well received book Ratification. While Maier clearly knew a lot about the past, she appeared to have had the weaknesses typical of historians. This statement from Steven Haywood at Powerline seems similar to my complaints: “She seemed to embody a trait found often among historians, of mastering and uncovering important facts, but having no systematic grasp of the wider theoretical implications of the subject matter.” That was my own limited experience with Maier, which I blogged about here. Briefly, lawyers are experts in identifying the meaning of language in legal context; historians are not and, to their credit, don’t even try (unless they are submitting amicus briefs to the Supreme Court). In addition to describing past events, historians are particularly interested in explaining why what happened in the past happened, why people did what they did; as a result, they are very concerned with identifying motives, or other causal influences. Historians have no particular interest in the meaning of authoritative legal texts, unless they are legal historians who are very often also lawyers. The fact that a legal text is old sometimes makes the identification of meaning more difficult, but far from impossible in most cases. For one thing, the meaning of language hasn’t changed that much. “Public Constitutionalism and the Antebellum Cemetery” joins the growing literature on public constitutionalism by focusing on the seventy addresses given at cemetery dedications from Supreme Court Justice Joseph Story’s address at Mount Auburn Cemetery in Cambridge, Massachusetts, in 1831, through the addresses of Edward Everett and Abraham Lincoln at Gettysburg in November 1863. The addresses were part of a vibrant public discussion of constitutional principles, which spanned such diverse occasions as July Fourth celebrations, arguments in great constitutional cases (like Daniel Webster’s Dartmouth College argument), dedication of public monuments (like Daniel Webster’s speech at the placement of the cornerstone of the Bunker Hill Monument in 1824), lyceum addresses, and college literary society lectures. For Americans, especially those of the Whig Party, the Constitution was a key component of culture and a key unifier of the nation. Rural cemeteries provided support for such constitutional values. They brought beauty and order to the landscape; they served to mediate an impersonal, commercial world and brought uplift through the lessons of morality and patriotism that people learned when they visited the cemeteries. The cemetery supported constitutional values of Union, respect for property, and obedience to the rule of law. For visitors to the cemetery learned about the importance of each of those values at the cemetery. It was an instructor of values; its ordered lanes and graves also served as a sign of the health of the Christian republic. For the cemetery fulfilled duties owed the past. The cemetery inspired sentiments of love of family and country. People would leave the cemetery inspired to preserve the United States as a Christian republic. Finally, these abstract ideas were promoted through private charitable corporations. Those private organizations brought the community together to promote the republic. The cemeteries were, thus, one important institution – along with the schools, churches, civic associations, and businesses – that helped create and preserve the Union. The cemetery dedication addresses, like other addresses designed to promulgate constitutional ideas, mixed appeals to economics, morality, religion, and political theory with legal and constitutional ideas. Rural cemeteries promoted Whig constitutional ideals about order, patriotism, and Union. Those values were at the center of the debate over the response to secession and they were put into practice by soldiers along Cemetery Ridge at Gettysburg in 1863. Lincoln’s address at Gettysburg, thus, reflects the appeals to sentiment and Constitution that were so frequently invoked in the thirty years before the War. This article reveals an important and neglected role of oratory in disseminating constitutional ideas, as well as the significance of rural cemeteries to public constitutional thought. This hidden history reveals how those ideas mobilized support for Union and, thus, how public constitutional thought affects the actions of voters, jurists, and politicians. Recently, D.C. Circuit Judge Brett Kavanaugh has argued that the President enjoys a constitutional power of prosecutorial discretion. Mike Ramsey appears open to the possibility that the President has this power. I am not an expert on this issue, but I have reviewed much of the literature and I am puzzled as to why people believe that the President enjoys any constitutional power of prosecutorial discretion. Where does it come from? What are the original materials that support it? The Congress ordinarily has a power to mandate the execution of a law. Judge Kavanaugh writes that "[p]rosecutorial discretion does not include the power to disregard other statutory obligations that apply to the Executive Branch, such as statutory requirements to issue rules, or to pay benefits, or to implement or administer statutory projects or programs." And certainly this is correct. It would be very surprising if the President could choose not to pay someone their social security benefits. If Congress passes a law that mandates the closing of a prison, that is required. If Congress passes a law that requires the executive to issue a particular regulation, it must do so. If the President is required to enforce other federal laws, then why is there said to be prosecutorial discretion for criminal laws? The President may decline to prosecute certain violators of federal law just as the President may pardon certain violators of federal law. . . . In light of the President’s Article II prosecutorial discretion, Congress may not mandate that the President prosecute a certain kind of offense or offender. The logic behind the pardon power further supports that conclusion. As has been settled since the Founding, the President has absolute authority to issue a pardon at any time after an unlawful act has occurred, even before a charge or trial. So it would make little sense to think that Congress constitutionally could compel the President to prosecute certain offenses or offenders, given that the President has undisputed authority to pardon all such offenders at any time after commission of the offense. Well, maybe, but I think the argument goes in the other direction. The pardon power and the power of prosecutorial discretion are distinct powers. That the Constitution gives one does not mean it gives another. If the President wants to protect an individual from prosecution, then he must actually exercise the pardon power. This argument is reinforced by the fact that there was private prosecution of crimes in both England and in the United States at the time of the Constitution. Perhaps the executive could exercise the pardon in those cases, but that does not mean he had the power to exercise prosecutorial discretion. The Framers saw the separation of the power to prosecute from the power to legislate as essential to preserving individual liberty. [Citing Montesquieu and Federalist No. 47] After enacting a statute, Congress may not mandate the prosecution of violators of that statute. Instead, the President’s prosecutorial discretion and pardon powers operate as an independent protection for individual citizens against the enforcement of oppressive laws that Congress may have passed (and still further protection comes from later review by an independent jury and Judiciary in those prosecutions brought by the Executive). Once again, I think this argument does not follow. It is probably the case that Congress cannot pass a law saying that the President must prosecute a particular person for violation of a crime. But that does not mean that Congress cannot pass a law saying that the President must bring an action against all persons where there is a probable cause to believe that they committed a particular crime. In this case, the President makes the decision as to whether there is probable cause, but there is no prosecutorial discretion. And if there are sufficient funds to finance all the actions, then the President must bring them. It is easy to forget what the dispensing power was all about. One of the core cases involved James II’s decision not to enforce the law requiring a religious oath to be taken in order to hold certain offices, such as military command. Sure such a law would be unconstitutional in the U.S., but because of religious liberty, not because it takes power away from the executive. That the dispensing power in this case could have been seen as protecting individual rights did not make it legal. The main argument that I have seen for prosecutorial discretion is that executives traditionally have been given this power. But that hardly makes it constitutionally required that they possess it. It makes sense to give the executive prosecutorial discretion because it is hard for the legislature to pass a sensible law that would regulate these matters. But that does not mean the legislature cannot take the discretion away in particular cases or constrain it various ways.